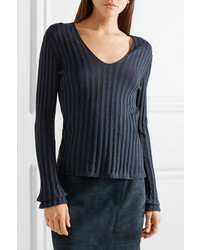 If you're on a mission for a casual yet stylish ensemble, wear an Akris ribbed silk blend sweater and blue denim shorts. Both pieces are super comfy and will look great paired together. Choose a pair of white polka dot low top sneakers to make the getup more current. 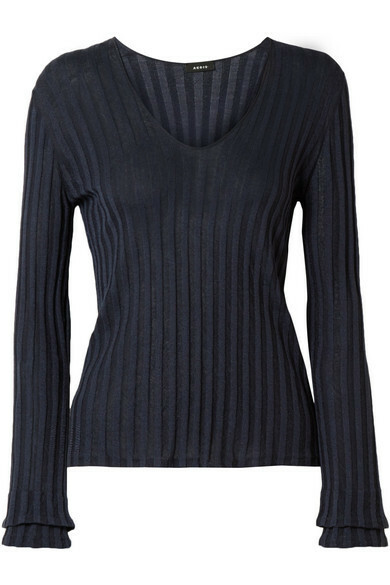 If you're on a mission for a casual yet absolutely chic look, marry a navy v-neck sweater with navy skinny jeans. These two pieces are super comfy and they also look wonderful together. You could perhaps get a little creative in the footwear department and spruce up your getup with navy suede ankle boots. If you're looking for a casual yet totaly chic look, opt for an Akris ribbed silk blend sweater and a blue vertical striped shirtdress. These pieces are super comfy and will look great paired together. Throw in a pair of silver leather low top sneakers to make the outfit more current. 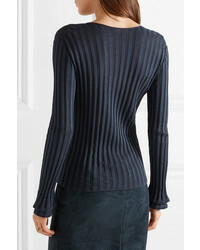 If you're looking for a casual yet totaly stylish ensemble, make an Akris ribbed silk blend sweater from NET-A-PORTER.COM and navy vertical striped dress pants your outfit choice. These two garments are very comfy and will look wonderful together. For something more on the daring side to round off this getup, opt for a pair of white low top sneakers. If you're after a casual yet totaly stylish ensemble, try pairing an Akris ribbed silk blend sweater from NET-A-PORTER.COM with navy dress pants. As well as very comfy, both of these pieces look great paired together. You could perhaps get a little creative when it comes to footwear and elevate your getup with black leather pumps. If you're obsessed with relaxed dressing when it comes to your personal style, you'll love this super cute pairing of a navy v-neck sweater and red geometric pajama pants. Bring a touch of sophistication to your outfit with black leather lace-up ankle boots. If you're looking for a casual yet incredibly chic ensemble, wear an Akris ribbed silk blend sweater with black skinny jeans. As well as very comfortable, both of these items look wonderful when paired together.